Lady Maxx Pin Up ! Va-Va-Voom ! I used a hot press watercolor board this time .. a bit different as I usually use a plain hot press board. What this meant was this time the board has some tooth (texture) to it … also being a watercolor board would allow for the paint to soak in a bit … something that as you will learn below came back to bite me in the behind !! This image and others to follow will be part of a ongoing series of Pin Up style giclees, posters, tee shirts (for Japan) ! By the way I can not say this enough, Lady Maxx was designed and the toy was sculpted by Makino-san of TTToys .. he captured Lady Maxx perfectly !!! 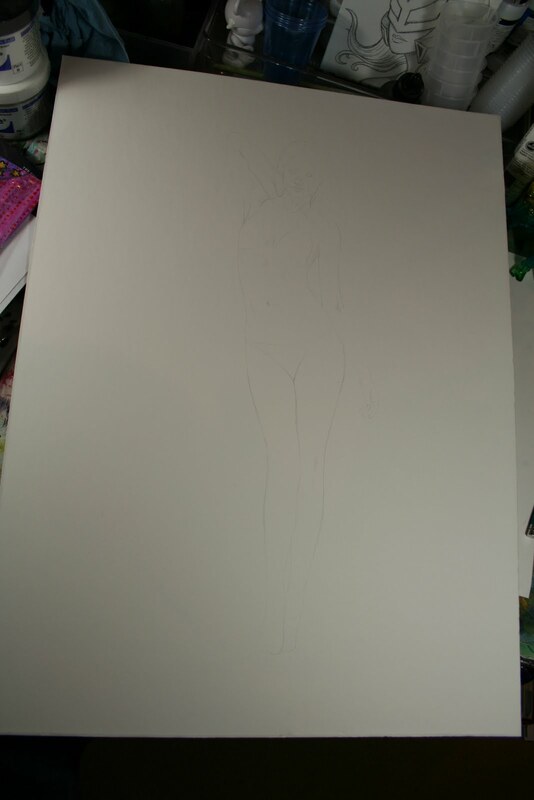 At this stage the figure is fully laid out. I decided I wanted to keep the colors and flesh tones vibrant so I did not do my usual of painting in the darks with paynes grey .. but rather used the pencil sketch as my general guide to the final tones. 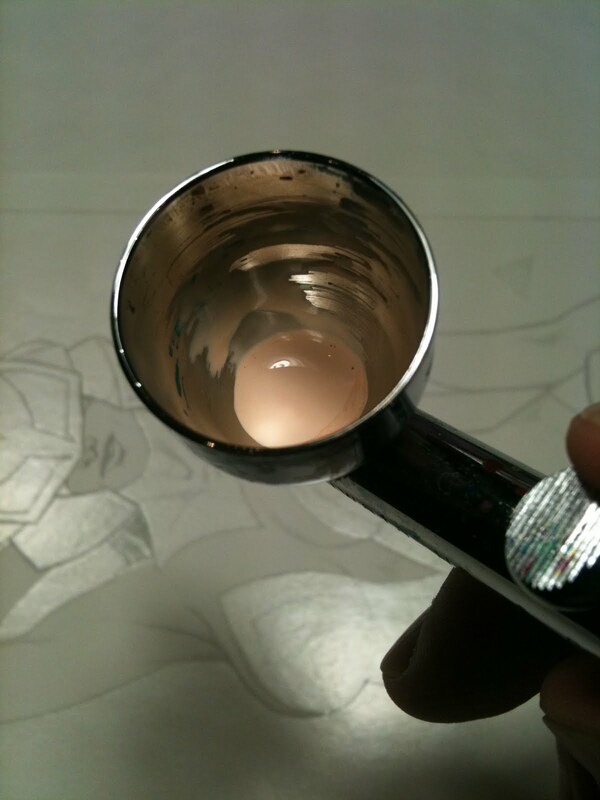 Using a plastic film called Frisket film, i laid a sheet down over the drawing.. this sheet has a sticky side that allows me to cut out shapes from it and remove / replace those shapes as i spray the acrylics. 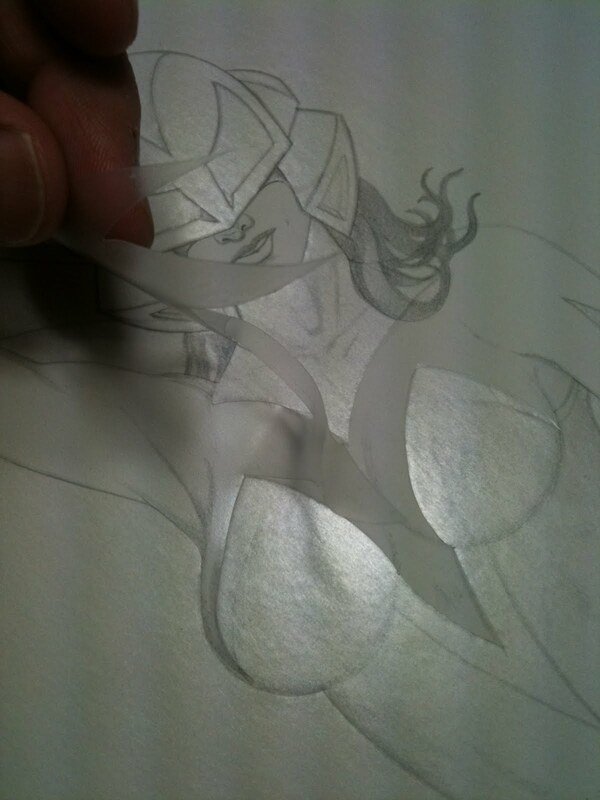 Using an X-acto blade #11, I carefully cut thru the film but not so hard to damage the board .. I like to think it is very much like surgery ! As you can see it’s a tedious process for each section … checking already sprayed areas that have been covered up, to make sure my values are working. If you look at the image above you’ll notice a very tiny red mark on her thigh (!) Due to my careless and late night blunder, that tiny section was not covered while i was spraying red paint … thus it left a mark ;-( Long story short i had to re-spray that area back down to white and starting with a light flesh, do the whole process again. That process took 4 hours total to fix the one mark. Well lucky for me I’ve been doing this for awhile so i knew what to do to save it.. wasn’t fun, but I could fix it. Your probably saying why didn’t you leave it and fix it in photoshop, which i could have done .. well I still believe in original art, so for me it was important to have this painting be painted perfectly. After all the masks have been removed, using a 000 brush i go back in and touch up areas, paint in the hair and such. Since i wanted to keep this on a white background I didn’t have to worry about one ! If you notice i also omitted her right glove , opting for more arm to be exposed ! I know this type of art is not for everyone and i respect those view points. My approach to Lady Maxx character is that she is a powerful, intelligent gal, but also has a playful side to her. 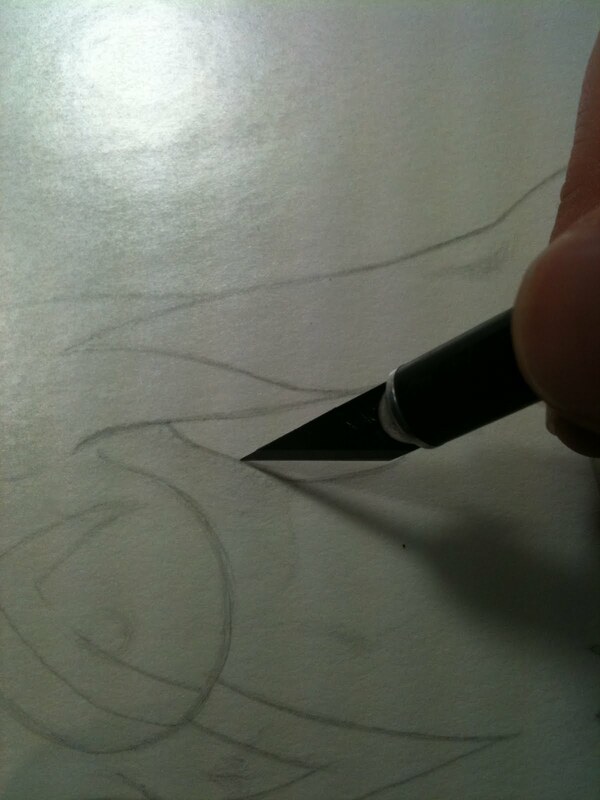 Hopefully I can convey this through my artwork. Later in photoshop I dropped in the red circle and text .. phew ! After a near disaster I was able to recover and finish ! I think it came out nicely .. I know I can do better and over this year as i do more hope to improve ! 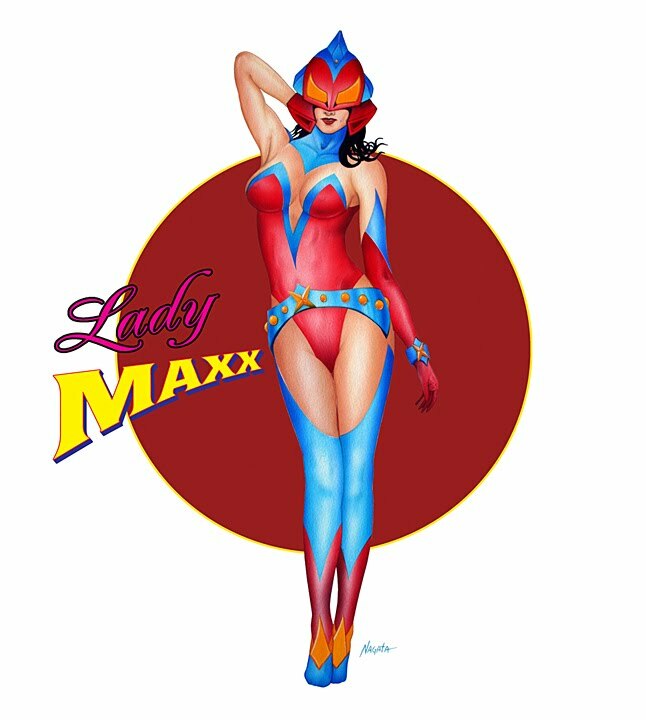 Look for a new Lady Maxx figure in the coming weeks via the Max Toy Company web site ! This entry was posted in airbrush, kaiju, Lady Maxx, mark nagata, Max Toy, Max Toy Company, pin up. Bookmark the permalink.